So you just moved into a new home in one of our NC coastal communities. Congratulations! Having the move itself behind you is surely a huge relief! Now it’s time to begin to explore the area, make friends and get to know your neighbors. 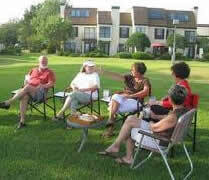 Following are some simple ways to initiate contact with neighbors and start building new friendships. If you have a housewarming party and invite family and friends to check out your new home consider inviting a few of your neighbors over as well. This is a great way to engage in conversation and build relationships with your neighbors. As you are out walking in your neighborhood, smiling and saying hello is a natural extension of yourself and is a great way to initiate conversation with your neighbors. Most NC coastal communities will post events on a central bulletin board, near the mailboxes, at the clubhouse or even through a social media platform such as Facebook. Whether a pool party, BBQ, community clean-up, community association meeting, or holiday party, it is important to attend these events as they serve as an incubator for socialization and developing friendships. If you notice a neighbor outside with children, take a few minutes to go over and introduce yourself and your children to them. Suggest a day and time for a play date. Not only does this provide an opportunity for your children to make new friends, it allows for adult interaction while they play. You’ll find the majority of people living in NC coastal communities are happy, friendly folks who would love to meet you.